Does the Sabbath command apply to Christians today and as such, should they not work on Sunday? What if their employer gives them no choice? Is it sin for a Christian to work on Sunday? Many Christians work on Sunday because their employer requires them to. Think about this. When Christians get out of church and go out to a restaurant to eat, they are expecting the restaurants to be open and fully staffed. They understand that certain goods and services are required seven days a week and for this reason, some Christians have no other choice but to work on Sunday or be terminated. The last thing Christians should do is to judge those who work on Sundays and then go out and expect to have goods and services provided for them on that same day. It would be hypocritical to tell Christians that they should not work on Sundays when we receive the services of others on this day. I know several Christians who have to work on Sundays and so they attend a Saturday night worship service or the might only be able to attend Wednesday night Bible study. They might possibly have the option of going to Sunday night services too. For circumstances beyond their control, many Christians and of course, non-Christians, have no other choice but to work Sundays. They have to provide for their families and employment options for them may be limited. Guess what? As a pastor and speaking for other pastors, we have to work every Sunday. Even in the Old Testament, the priests had to perform their most important duties on the Sabbath day and there were far more restrictions on keeping the Sabbath for the Jews under the Old Covenant. The fact is there are many Christians who have no other choice but to work on Sundays. 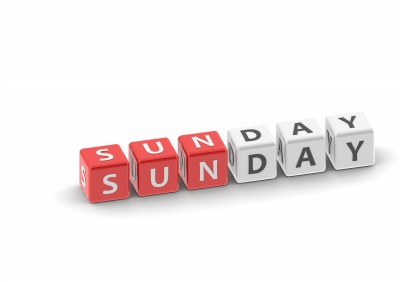 The fact is there are many Christians who have no other choice but to work on Sundays. This includes railroad personnel, turnpike operators, gas stations, restaurant staff, utilities crews, emergency personnel like EMT’s, ambulance drivers, fire fighters, and the police. What if they took the day off at the other end of the 911 emergency lines? What if fire fighters took off Sunday and they just had to let fires burn themselves out or hope that the occupants could escape? What about the Highway Patrol? What if they decided to not work on Sundays? How safe would the roadways be? Paul understood that many of the Jews still clung to the Old Covenant laws and were judging others for not keeping them. Paul’s reaction should be our reaction. He said in Colossians 2:16, “Therefore do not let anyone judge you by what you eat or drink, or with regard to a religious festival, a New Moon celebration or a Sabbath day.” Some in the church were judging others over things that were done away with by Christ on the cross of Calvary. The same principle applies to clean and unclean foods as it does to which days we can worship God on or what days we may have to work. Paul and the writer of Hebrews said, “They forbid people to marry and order them to abstain from certain foods, which God created to be received with thanksgiving by those who believe and who know the truth” (1 Timoty 4:3) however these were, “only a matter of food and drink and various ceremonial washings–external regulations applying until the time of the new order” (Hebrews 9:10) because these kinds of strange teachings “are of no value” to us today (Hebrews 13:9). Paul rebuked the Galatians for the very same thing, writing “You are observing special days and months and seasons and years” (Galatians 4:10), so “how is it that you are turning back to those weak and miserable forces? Do you wish to be enslaved by them all over again” (Galatians 4:9)? The Jews could never be saved by the Law just as no Gentile can be (Acts 13:39; Romans 3:20). Don‘t we “know that a man is not justified by observing the law” (Galatians 2:16)? The legalistic view had reached all the way to Rome as well. This is why Paul told the church at Rome that we “must not look down on him who does not, and the man who does not eat everything must not condemn the man who does, for God has accepted him. Who are you to judge someone else’s servant? To his own master he stands or falls. And he will stand, for the Lord is able to make him stand. One man considers one day more sacred than another; another man considers every day alike. Each one should be fully convinced in his own mind. He who regards one day as special, does so to the Lord. He who eats meat, eats to the Lord, for he gives thanks to God; and he who abstains, does so to the Lord and gives thanks to God. For none of us lives to himself alone and none of us dies to himself alone. If we live, we live to the Lord; and if we die, we die to the Lord. So, whether we live or die, we belong to the Lord. For this very reason, Christ died and returned to life so that he might be the Lord of both the dead and the living. You, then, why do you judge your brother? Or why do you look down on your brother? For we will all stand before God’s judgment seat” (Romans 14:3-10). Paul’s conclusion to judging others over the Old Covenant keeping, including restrictions on a worship day, was to tell them to “stop passing judgment on one another. Instead, make up your mind not to put any stumbling block or obstacle in your brother’s way” (Romans 14:13). The Law was not ever intended to save us. God knew that we could not keep the Law. The Law is intended to show us our sin and our inability to live a holy, blameless life. Jesus Christ kept the Law perfectly so we wouldn’t have to. It was and still is impossible for us to even keep the Ten Commandments. I thank God that the keeping the Law is not required for salvation. Not one of us would make it under those requirements. We have all fallen short of the glory of God. There is not one that is righteous in His sight. That’s why we needed a Savior because “He made Him who knew no sin to be sin on our behalf, so that we might become the righteousness of God in Him” (2 Corinthians 5:21). This is the exact reason why Paul wrote that “whatever you believe about these things keep between yourself and God.” (Romans 14:22). Whatever you believe about what day the Sabbath is, what day you should worship, what day others should worship, and whether a person should work on Sundays or not, we should keep it between ourselves and God because God has accepted us. Should we not also accept others and not judge them over these things? Thank you Jack. I work nights so this makes going to church on Sunday morning and staying awake quite difficult. I try to make it on Sunday or Wednesday night but over the past year that has become less frequent. I can tell the lack of quality sleep has caused depression and anxiety in me. I’m so jealous of those who are able to sleep at night. Will you please pray that God will open a door that will allow me to go back to working during the day? Thank you for time and effort you put forth to this website. Thank you Kevin. I am glad it could help you. We can not judge others by whether they are able to go to church on Sunday as we can keep every day as unto the Lord. I am a bi-vocational pastor and so I have to work after Sunday school and the sermon and so I understand. I will pray for you my friend for a day job and that you can sleep at night like most. May God richly bless you sir. Thank you Linda. I am overjoyed this article could help give you some comfort. As I told Kevin, we can keep every day as unto the Lord. I am a bi-vocational pastor and so I have to work after Sunday school and the sermon and so I understand. May God richly bless you Linda. Thank you Jack, for another informative, biblical response to a question I’m sure many Christians wrestle with. Great job with this (sometimes) sensitive subject. Thanks my friend. I agree, it is a sensitive area and I pray that Christians not divide over this issue. Jack, I thank you for this article. It will surely be a blessing to many many people! You have conveyed with such clarity the message of God. I hope and pray that those who read it will feel God speaking to them because God has definitely used you on this topic brother. Thank you friend! Had read this article about a year ago, but it had more meaning when it popped up on my Facebook page this morn. Amen Patty. You are spot on the mark my friend. We can’t encumber others by what we feel they should do for we are under grace and not under the Law. Thanks friend. Great article as always. Thankyou. I agree completely with what you say about judging others but that does not mean that we should not judge ourselves. Here in the UK we have resticted opening hours for most shops on Sunday (and a complete ban on Easter Day), so there is still some semblance of keeping the sabbath special. To me this is a matter of your motivation for working on Sunday. You rightly refer to essential services which we need to maintain and some people would be unable to support their families if they were sacked (terminated) for refusing to work on Sundays but I think you need to take care if your motivation is to get extra money or if you think it does not matter what you do. Grace is surely not a licence to do whatever we please. As Christians we need to be careful that we do not encourage others to work on Sundays by spending money on things we could just as easily get the next day. As Jesus said, God made the sabbath for man not the other way round because He knew that we needed periodic rest from our labours. Some years ago I worked in the middle east where the sabbath was Friday so I thought I was doing the right thing by taking my sabbath on that day rather than the Sunday. I guess you might do something similar as of course pastors have to work on Sundays. Mr. Harris….I agree about observing a Sabbath rest on Friday and I believe that whatever day you observe, do it as unto the Lord. As for me, I rarely get a day off as I am a bi-vocational pastor and so for me it may come in the middle of the week as I work with a foster care agency in Kansas. I appreciate your kind words sir. Thank you and I thank God for you. Thank you Ghislaine. I appreciate your kind words. Thank you and I thank God for you. necessary to observe what God had commanded or go along with the changes of times? I agree with the word of God has not changed! As far as the essential services I.e. police, emergency services no doubt we need those but here is the ulimate question do these employers rotate weekends so that an employee can at least attend church and have 2 to 3 Sunday’s off a month??? That is question we should be asking, working Sunday is not a big deal as long as its not every Sunday. Jack, thank you so much for your prayers. I was just told that my current job will be moving to a day shift at the end of next month. I’ve been working nights for over 2 years and I’m so thankful that’s coming to an end. I give God the glory and praise for making this happen. Prayer does work! Thank you Jesus! To Him be all the glory. That’s so awesome because your God is so awesome Kevin. don’t ever believe in any Covenant or “new Covenant” from anyone or “God” who tells someone they must die for gathering wood. You as a pastor, just to keep your sanity … must totally just ignore that fact. Chris, your last paragraph says it all my friend. Thank you for contributing much to this article. I’m probably just not understanding clearly enough, but what are you saying in your comment? Are you saying that we cannot believe in God because He commanded stoning for disobeying Him? Please correct me if I’m misreading you, have a lot on my mind these days. I’m just trying to fully understand. Thank you for asking and replying, as far as the comment about my last paragraph “says it all”… actually no, what “says it all” would be what is written in the book you believe to be truth. I was hoping you would comment about the passage I mentioned rather than just skipping it. @Robert most definitely the radicalism in killing a human being for working on a certain day, in this passage, gathering wood on the Sabbath is without question wrong. If a god created laws and was omnipotent, omniscient, etc…that god would not change it. what happens to radical individuals and leaders today? they are stopped. What happened to to old testament god? He was stopped. You might be shocked because you want to believe in it but actually think of this: and by the way this is my own view…please copying, the new testament kinda is the old testament’s application for parole. All jokes aside, it obviously didn’t work at that time and doesn’t work today. You can’t kill anyone for working on a certain of the week and yes it is evidence of religious radicalism and shouldn’t be tolerated. Well, I agree with you on one point: the Bible does ‘say it all’. The problem is that too few of us listen to it. It always amazes me the lengths those who reject God will go to in their attempts to discredit His character. In your case, you assume the place of authority that only God rightly possesses, then you attempt pass judgment on what an omnipotent, omniscient God would do. If you understood the Book you are mocking, you would understand that disobedience to God is no little thing. When God instituted the law of which you speak, He did so to show the world (through His chosen people, Israel) that no rebellion against God is a little thing and all sin is deserving of death. And it still is, although the death we all deserve is an eternal death, not merely a physical one. [I’m taking the time to explain here hoping that you really care about the truth and are not here simply to argue]. On the other hand, God loves us enough to provide a way that we can be forgiven of our rebellion (sin worthy of death) and be reconciled to Him through faith in the payment Jesus’ made for our sins some 2000 years ago. Now, the choice is ours; either to repent and follow Him or to reject His call and continue in willful rebellion against Him. If we continue to rebel against Him, we will be worthy of eternal death just the same as the Israelite was worthy of death for disobeying God’s law about cutting wood on the Sabbath. We don’t set the standards, God does. I pray that God will open your heart to His truth and His love. If the Christians would not buy anything on Sunday, then the store would not do enough business to stay open. I agree William. Many unfortunately have no choice. As a bi-vocational pastor I have to work but make it so I can attend Sunday school and give the message and then off to work. Many who have to work on Sundays can do the same thing so that they don’t have to miss church. You are right that we should not forsake the assembling of ourselves. I couldn’t agree more sir. Thank you for your comment. I am a person who works in a retail store on sundays and i miss sundays going to church.It’s hard to get my schedule change the retail business don’t understand.You tell them to change your schedule and dont care and don’t understand people go too church on sundays.I am so getting frustrated with this job. Rob, I completely understand my friend as I am a bi-vocational pastor and work after Sunday school and the Sunday morning message. I am so sorry my friend. They are making it very hard for you sir. Thank you for your wisdom and sharing it with us. I was struggling with the thought God won’t accept me if I don’t keep the sabbath every week. I have to work every 3rd Sunday to keep my job. I prayed & God led me to the same verses in Galatians and found your post. Thank you again and Thank God He is so wonderful and loving. I am glad this helped you because we are not under the so you have no reason for guilt and I am so glad this gave you reassurance and thank you and may God richly bless you my friend. Thanks for such a well written and explained article on this subject. I have spent my whole adult life in some form of law enforcement or public security service and regularly worked on Sunday. Now as a Bi-vocational Pastor and senior level manager of a government security agency I am dealing with other people who are struggling with this issue. This is a great reference that I will keep at hand to help explain this issue to others. As Christians we are required to go on Sundays . Jesus rose on the first day of the week . It is called Easter every Sunday is supposed to be Easter.. There used to laws against working on Sunday in pennsylvania used to be called the Blue laws .Only a greedy corporation like wallmart will be open .Sunday is suppose to be a complete day of rest and bible study . America is forgetting about Jesus and God . The untied states is only concerned about allah . and the muslims. they are suppose to pray five times a day. do they get to do that during work; sure they do. but heaven forbid you even mention Jesus . they say lets crucify him.how about if christians do not shop on sunday or buy nothing . Imagine your not in church and Jesus comes back on a Sunday. He might say to people depart from who work inquity like at walmart. one other proof . All of Hitlers men said during the nurremburg trails said we was just following orders even on sunday. This is a great article. It clears up confusion. The very beginning of the article should be obvious. There are a lot of service industry jobs that do require that people work on Sundays, regardless. Almost every job that I have had has required me to work on Sundays. Ironically, the very people who would judge or criticize me for it were people who were not even significant in my life; they were usually the people I only saw when in church, or the people who would always ask me for favors, but never give anything in return. My family has never criticized me for working on Sundays or even holidays. My mom would do her best to work the holiday dinner and gathering around my work schedule when I had to work. I like the very last points that are made in the article above: Whatever you believe about the Sabbath and whether or not people should work on Sundays should be kept between you and God. I might add that what most Christians believe about their faiths should be kept between themselves and God instead of trying to evangelize as I think that is it counterproductive to preach at someone whose beliefs and needs are different from yours. I worked swing shift 33 years in a steel mill that ran 24/7, so I worked three Sundays out of four. I struggled with this question but also worshipped Sunday evening when I worked day shift or was sleeping after nights. The Lord blessed me and my family with this job and I did my best not to work unless I had to. I am thankful for his mercy and grace that sustains me. Thank you Jack for your insight. I was raised to follow Christ’s example. Christ stated that He was not there to CHANGE GODS LAW. The 10 commandments still stand. I don’t go shopping or go out to eat or work on the sabbath. It’s in the 10 commandments. You do no work, nor do you make anyone work for you. The only exclusions is common sense, like emergencies and health care work. Funny, it’s the only commandment that says REMEMBER, not “thou shalt not” this or that. God never changes. The 10 commandments came directly from God, not from man. Jesus kept the Sabbath, Jesus’ words are NOT changed nor are God’s by Paul. Truth is truth. Follow the commandments and follow Christ’s example.